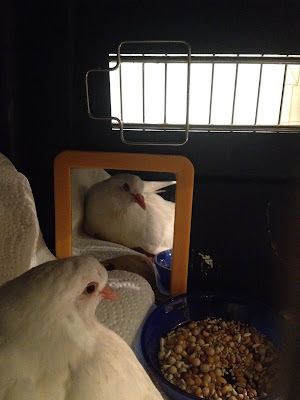 Yesterday, after spending the day with five other volunteers building a much needed aviary at the Petaluma home of a MickaCoo foster volunteer, I went to the Marin Humane Society to pick up Quinn, a flightless king in need of rescue. I arrived an hour late and so was there when a very weak and sick baby king arrived. He had been found at Fisherman's Wharf in SF and the Good Samaritans that rescued him drove him all the way to Novato. 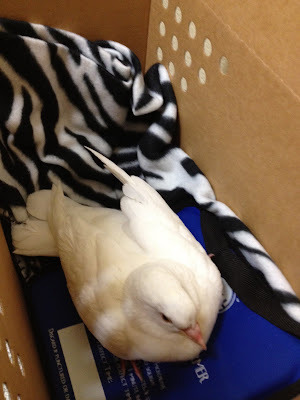 The poor bird, only about 5 weeks old, was very weak, emaciated and had labored breathing. His mouth was full of canker plaques (trichomoniasis) and his vent was caked with diarrhea. He was cold and MHS sent us home with a nice, big, microwave-warmed pillow. I had canker meds in the car and gave them to the baby I named Prince before we even left the parking lot. 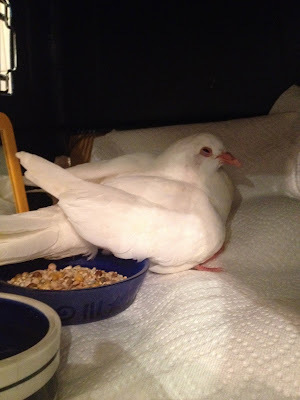 Once home, I showed Prince the other king pigeons in the hopes of lifting his spirits and easing his mind and then syringe fed him a light meal of watery juvenile formula with Pedialite before tucking him in on a heating pad. His breathing worsened and he died around midnight. I'm really sad what all this poor baby had to go through. 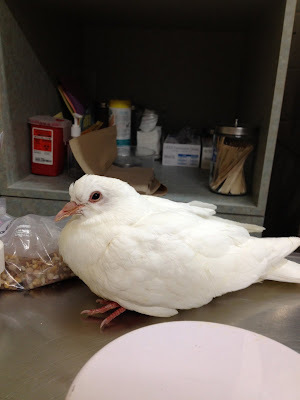 A baby king pigeon that was rescued at Fisherman's Wharf yesterday died in my care last night. It had a bad case of trichomoniasis and probably died from respiratory failure. It likely had other issues as well including coccidia and possibly salmonella, to name a couple. Does anybody care that these birds sold for meat are so often so sick? This baby, that I named Prince, is not at all unusual. Lots of these babies come in sick. I have this bird's body refrigerated. Would anybody be interested in performing a necropsy? I've not yet received a response. 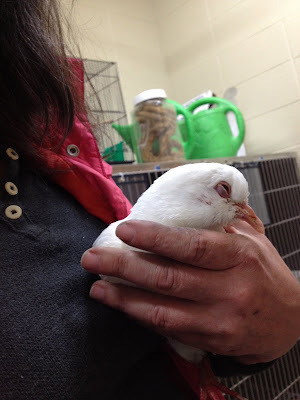 Releasing domestic birds and animals is cruel, not kind. They do not have the ability to survive in the parks and streets. They suffer and die.